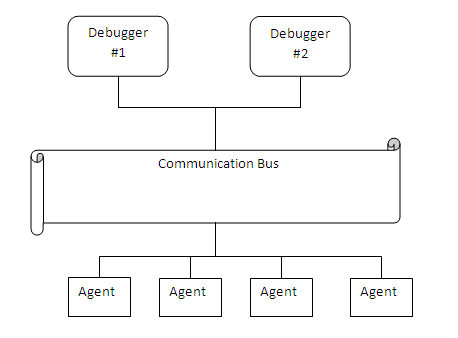 Each agent connected to Query Exchange can optionally include the QeDebug facility which allows a central debugger to communicate to agents while they are processing. This document outlines the protocol used by the debugger, not directly how to use QeDebug. The protocol is a packet based system with asyncronous command and reply packets. Each command packet is placed on a shared communication bus and agents read this bus. All agents see all debug commands, but command packets are typically addressed to individual agents so single agent debugging is possible. The command and reply communication channels are typically implemented as in memory ring buffers, so agents and debugger need to be reasonably responsive. However, the communication bus can vary from shared memory to TCP, UDP or other methods, so packet transmission is not always physically to all nodes. Technical. Debug Protocol can also be sent over channel 5 on GNAD links. This permits remote programs to communicate debug control information specifically. The protocol described here is also known as TUBS protocol 4. The QeDebug protocol includes information about internal operation and can be highly dependant on version and specific operating conditions. Reply packet contents may not be fully documented as the information is considered too technical, sensitive, not mainstream or experimental. Not all fields will be documented. In general, fields are only documented if they are of use without intricate knowledge of the source code. Most users do not care about the size of an array or information controlling algorithms. Anything that could be useful to support will generally be documented. The rule for developers is to document, unless there is reason not too. 101 Excode Executor group for Opcode. If not supplied the default executor is invoked. Each Opcode is passed to the relevant Excode handler, which means that the same opcode number can have different purposes for different Excode handlers. The opcodes listed on this page are for Excode=0 (default). 99 Unused parameter that can be used as cache breaking value when QeDebug is sent over cachable protocols such as HTTP. 120 MaxWait Maximum time to wait. Approx milliseconds not exact. 121 MaxReply Maximum number of replies to wait for. When this many are received the call returns. 602 ControlNumber General purpose number argument. The exact purpose is up to each command to decide. 606 ThreadSelect Thread selector. Used to select the reporting of specific thread by another thread. Typically this is used on calls that allow thread A to peek into thread B and return information. Rarely used. 200 CurStatus Request a complete current status packet detailing each thread and critical internal state. This packet is expected to summarise internal activity. It is expected to be reasonably large perhaps around 5K per program. 201 DetailedStatus Request a detailed status packet. 202 LiveTrace Contains a live trace message. This packet type cannot be requested, the tested system constantly sends these messages when capturing of live trace is enabled. 301 GetSettings Request current settings in use or available to change. Settings are used to dynamically alter the runtime behaviour of an agent. Response consists of a number of settings blocks. F605 can be used to search for leading prefix. F601 controls search mode. 0 = Name starting with, 18 = Value like search, case insensitive. Responding agents are not required to implement search ability. 50,001 PosCmd Process PosCommands. This command is only used by PosGreen. 122,500 Inbound transactions sent to individual POS by local interfaces. 123,000 - 123,999 Reserved for Fieldpine POS fpscreens.dll specific commands. Some of this range is undocumented as it may refer to customer specific information. 140,200 ThreadList Return details about all threads in the target process. 140,201 ProcessMemory Details about current process memory. 140,202 ProcessModules Information on modules loaded into process memory. 152,003 Report system ATOM table usage. 152,006 Locale Return all locale settings relating to date, time, currency, language. Some test values are also processed and returned to validate actual operation. 210,001 MeshTest Internal testing functions. Reserved for internal debugging. Not recommended to call. 113 Key Session identification key. 114 SampleTime Date/Time this sample was taken. Optional to return, but typically returned for tests that might be repeated in a single session and vary over time. This value is LocalTime. 122 Length2 Length of information. Opcode specific meaning. 123 Comment Human readable comment about the response. Might be used to convey additional information, but is not designed to be parsed and used by systems. 700 ImageData Binary Image data. This field contains binary data so callers that request commands that return binary data need to be able to correctly handle this data type. This packet is used when a setting is to be returned or set. Mainly used by commands GetSettings (301) and SetSettings (302). 112 Environment Contains an environment number if this setting is specific to a single environment. 150 Description A description describing the setting. 151 Scope Is the setting expected to be the same at different levels. 1=differs by lane, 2=differs by database, 3=differs by complete system (ie, all machines for a single retail environment are expected to have the same value). 153 Title A short description describing the setting. 154 Error How important errors in this setting are considered to be.